﻿The day started out misty and drizzly, and stayed that way until the afternoon, when it turned to intermittent rain, then steady rain, and occasionally heavy rain. Fortunately, it stayed warm, so we weren’t worried about the horses, they needed a rinse off anyway. Spent the day watching movies and relaxing, with plans to ride tomorrow, as the forecast looks much more promising. Set the alarm for 7:00 and headed out early, as it’s going to be a long drive today. We managed to get out with no problem, for which we were grateful, and headed straight to the Walmart in Lake Charles, where we did our shopping and got fuel. Afterward we detoured to the Post Office to mail a letter, though was disappointed that it was closed on Saturday. Dropped it anyway, so I wouldn’t have to worry about it anymore. 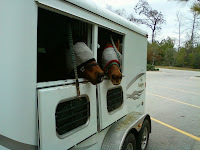 Stopped once at a Winn-Dixie to pick up salad mix that I forgot earlier, and to give the horses a drink. After one wrong turn that Gracie (my GPS) made me take, we were soon back in familiar territory. This was the first camp we’ve been back to since we left in December 2009, and it was a welcome sight. 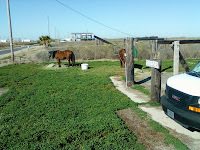 We filled up with water at the maintenance office by the Airey Tower, then drove back down to the Horse Trail and Camp. It was very crowded, which was a rare and pleasant surprise, it’s been so long since we’ve been at a horse camp with lots of other campers. Of course, that’s one of the reason we seldom arrive on Saturday, but we know this place was big enough to handle whatever crowd was here, and weren’t worried. We ended up backing into a space at the far end, a place we had remembered from last time, that’s close to the water (not that we’ll necessarily need it), and away from the rest of the crowd. There was one guy here in a small truck nearby that looked like a homeless guy and his dog, and in fact, we seemed to recall he was here last time we were here (without a horse) back in February 2010. We set up so the horse trailer gave us a “circle the wagons” kind of privacy, but I guess that wasn’t enough for the guy, he packed up and moved out. Well, it’s a free country, and there’s no designated camping sites, just fire rings, corrals and picnic tables scattered around. Besides, it’s a HORSE CAMP, which means you should be camping with a HORSE, not taking up space when there are campgrounds elsewhere you could go without a horse. Anyway, things worked out, and we set out our highline, got settled in, satellite dish and all, in no time. After a rocky start yesterday, we were looking forward to a pleasant ride today. The forecast looked good yesterday, with 5-10 mph breezes, but by this morning, that had changed to 15-20 mph winds, and they were a bit cool, so we had to bundle up in parkas for our beach ride. For some reason (likely the clover), the horses were VERY antsy today, skittish at everything, leaping sideways for no reason. We took the dogs with us on this trip, and that probably didn’t help much, but it wasn’t the reason. 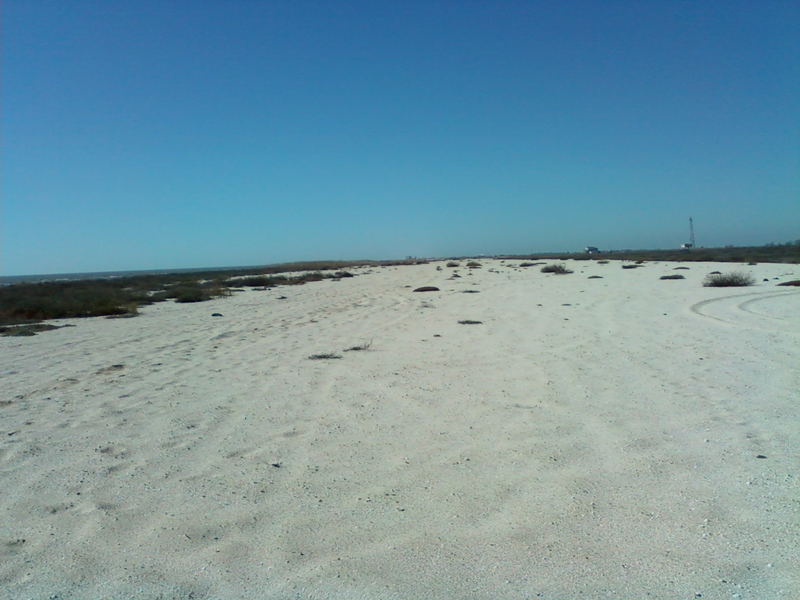 We headed east until we reached a fence, surprised at the number of platform (we assumed oil) just off the coast. The beaches were much wider than anything we’ve been on except maybe Assateague Island in Maryland, but there was quite a bit of trash, though not as bad as some we’ve seen. Once we turned around and headed back west, the horses seemed to have burned off most of the excess energy, and we enjoyed the ride back a bit more. We passed the road we came in on, going a bit more west, but ran across more blockades, so we headed back to the homesite, having been out maybe 90 minutes at the most, just a few miles round trip, but enough to give the horses some exercise. Nevertheless, it was a good place to stop halfway between between Bigfoot Horse Camp and Houston, which has a dearth of places to overnight with horses, and no doubt we’ll be back again if and when we head west along I-10 again. 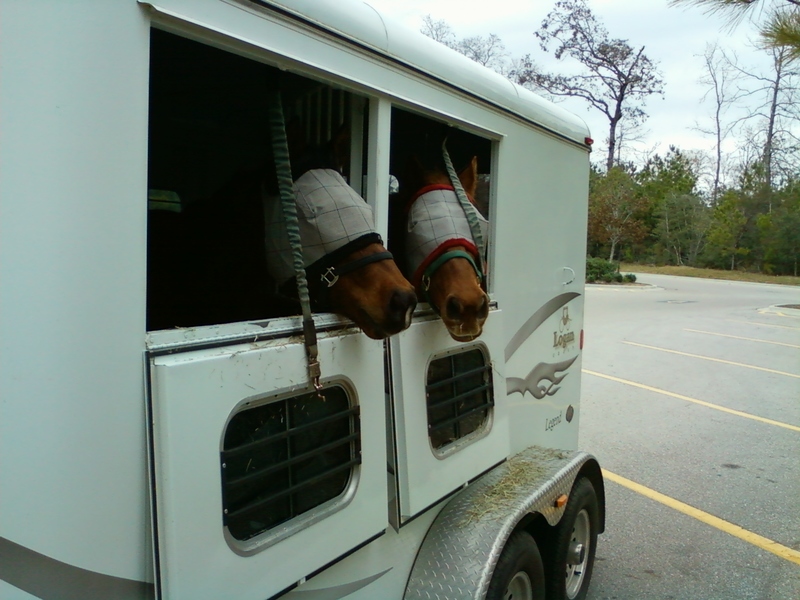 Got up fairly early, packed up, loaded the horses into their new, fantastic trailer, and headed out to our next stop, Rutherford Beach, LA. We found out about it on www.horseandmuletrails.com, which has become one of our favorite websites for finding out of the way places. Not always accurate, but a good start nevertheless. It had listed this place, along with the name and number of a very kind Southern gentleman, who is essentially a parish commissioner, who welcomed us heartily, and reminded us of how much we missed Southern hospitality. Though people have been nice almost every place we’ve been, there’s something about the “above and beyond” that Southerners do that warms the heart. After stopping at an RV park on Sabine Lake, just before crossing into Louisiana to pick up water, and after we took the ferry across into Cameron (which was a pleasant surprise, but did slow us down a bit), I tried to call this gentleman (his name was Scott), but my cell phone didn’t have a signal. I figures we could go down to the area we knew we were going and try to reach him again, but after we passed through Cameron, I received a text message from Scott, saying he saw us going through town, so he hopped in his truck and followed, then passed us and led us out. Right off the beach there are two streets where there used to be houses, but those were wiped out during Hurricane Rita a few years back and for the most part, never rebuilt. There were several structures that essentially were covers and porches for RV’s, but only one real house on stilts. The lot he had gotten permission for us to use had part of a concrete pad and some wood stills, and the rest was plush green clover, something I knew the horses would love, but we would have to limit their intake and make sure they had plenty of water to protect them from colic. After Scott left us (after we declined his invitation to take us to dinner :-), we started getting settled in. Unfortunately, we got a little too settled. The clover was so dense that we didn’t realize just how soft the ground was underneath, and when we back the horse trailer up toward the back of the lot, the wheels of the van got stuck, and we couldn’t move. We took out the horses and tied them to a couple of posts, then had to unhook the van and reposition it to get out of the ruts we had made. We put a couple of pieces of plywood under the wheels as well, but that still wasn’t enough. So we had to move the RV back up on the road and unhook it, so that we could use the truck to pull out the van and horse trailer. Finally in tandem, we were able to move everything out. 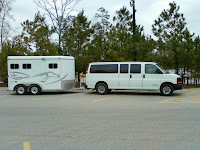 We backed the horse trailer between the stills so that the van’s wheels were on the concrete pad. Then we hooked the truck back up to the RV trailer, and pulled that in, trying to stay somewhat close to the road in an effort to not get stuck there. That didn’t work either. We ended getting the truck stuck as well, because the weight of the trailer sank deeply into the soft ground. So then we had to unhook the van from the horse trailer and move that to the front of the line and try to use that to pull out the truck and the RV. Unfortunately, that didn’t work, and a couple of times the wheels of the van spun and slipped so badly I thought it was going into the ditch next to the road! So we had to unhook the truck from the RV again, reposition it at a different angle, hook the van up at the front and try again. Fortunately, this time we made it! We finally repositioned the RV along a previous set of tire tracks where the ground seemed firmer because the clover had died off along that path, and kept the truck as close to the road as possible to hopefully avoid any further problems. Then we ran a highline from one of the stilts to an electrical pole, which gave the horses a pretty good run, and fed them some more hay (they had already gotten tired of the clover, would you believe!). In all, it took us more than two hours to get settled, which was absurd considering it was an open lot, but at least we managed in the end to get it done before dark, which was all that mattered. Our new back yard faces the sunset, so we enjoyed that as our reward for a hard job well done (though I felt like our troubles were mostly self-inflicted by not being careful enough, which is always rather unsettling). After feeding the dogs, then us, we settled in for the evening, watching the good action film The Bourne Identity, before crashing into bed around 11:00. Spent the day doing laundry, cleaning and generally getting ready for our long-awaited departure tomorrow. Discovered the box of books I had ordered had arrived, albeit a day late. As it turned out they weren’t necessary at all because of the low attendance in the end, which means we now have to haul them around for awhile, extra weight we really didn’t need. At least we got the laundry done. Made ourselves at home, had breakfast and then got ready for the day. Didn’t have quite as many attendees to her private session as we had hoped in the end, and started later than anticipated, but still had a pretty good session. As soon as we finished, we packed up, had a quick meal and headed back to Houston. Stopped for groceries and gas, arrived back late, went to bed exhausted. Ignored the alarm when it went off at 8:15. We both had been awakened by a heavy downpour about an hour earlier, so needed a few extra zzzz’s. Finally got up, had breakfast, piled some hay in the barn so the horses would get fed while we went to Austin for a day or two, packed a bag, and left, late, to get to my physical therapy appointment. Arrived 15 minutes late, partly because my Verizon GPS was giving me fits. I had been charged for downloads I never made last month, so when I called to complain, they put a lock on my Media Center because they assumed I was accidentally hitting buttons that were creating wrong downloads, and in the process I think they shut out my Navigator, though I had used it once or twice yesterday, but it was taking 8 or 10 tries to hook up. Anyway, they graciously took me anyway, despite my tardiness. After we finished, we headed out to Austin, with a now unblocked Navigator that worked fine the whole trip. Two and a half hours later, we stopped at a Chinese restaurant for a dish of House Special Fried Rice, which, according to Hubby, was the closest thing he’s ever been in this country to his beloved Singapore memories of Nasi Goreng. Afterward, we re-pointed ourselves to downtown Austin, to find our hostess’ condo, which was just two blocks from the Capitol in Austin. She hadn’t arrived yet, and had been unreachable by phone or text so far, but a quick call to son David set the concierge straight, followed almost immediately by a call from our hostess as well, and we were allowed upstairs to let ourselves in and make ourselves at home. Made ourselves comfortable as we await her arrival, going out on the balcony to see the lovely view of the Capitol building at night. Expect we’ll talk for a few hours when she gets back, then get a good night sleep on what looks like a nice plush guest bed. 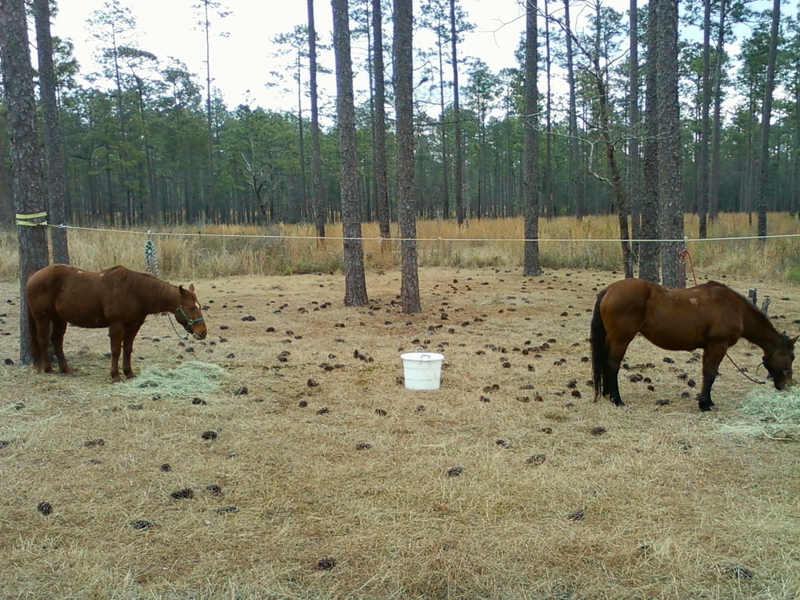 Set the alarm for 8:00, then after breakfast we got the horses loaded up in the new trailer and headed for a short 15 minute ride to nearby WG Jones State Forest in Magnolia, TX. Had no trouble finding the horse trailer parking area from the map I downloaded from the internet, where we joined half a dozen other horse trailers in the dirt parking lot. Saddling up was so easy, with everything right there in the dressing room. One thing I learned, I have to have a lead rope ready before I open the back door, my gelding tried to come out on his own and got a bit scared when the tie-in rope stopped him halfway out. I quickly calmed him, got his lead rope on and backed him out, sort of sideways, as he’s so used to backing out straight he wasn’t quite sure what to do, and neither did I. Hubby’s mare came out easy, and after a quick brushing, hoof picking and rasping on my guy’s front hooves (his hooves grow SO fast! ), we were soon on our way. The beginning of the trail was like a tunnel, with wild privet on both sides. 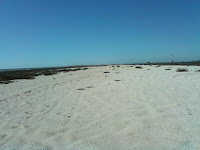 That led shortly to a dirt/sand road, which is the predominant type of trail here. It almost looks like someone had the idea of making it a planned housing development, as the roads are on a grid, but it never got even far enough for gravel roads, it’s all pretty much soft footing, thank goodness. We headed down Cochran Trail to the south, then turn west on Middle Lake Trail, because I wanted to see the “lake.” It was more of a pond, actually. We ran into several other riders and hikers, but it never seemed crowded. They bill this as an Urban Wilderness, which is an apt description. The park is surrounded by busy roads, and you can hear traffic noises whenever you get near the edges, but once you get more in the middle, you don’t hear them so much. After we got out fill of roads and got a lay of the land, we broke off to follow some real trails that came off the roads. That was pleasant as well, with signs of a well managed forest, mostly white pine I guess, along with the undergrowth. One area had been bulldozed, but I suppose it’s because they can’t exactly do a prescribed burn with so many houses so close by. We were out for a little more than two hours (it’s only 1700 acres), but it was the perfect length considering how long the horses have been stuck in a stall. 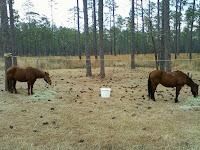 They seemed very happy to be out riding, with Hubby’s mare walking faster than she usually does. They didn’t get crazy or too frisky, but they definitely seemed to enjoy themselves just as much as we did. When we got back to the trailer it was so easy unsaddling and putting everything away, it was like a dream! We stopped at Walmart on the way back to pick up a portable vacuum cleaner to keep the carpet in the dressing room clean, as well as the interior of the vehicles (especially my truck), and a couple of other items. Had no troubles getting the horses put away, but during the trip, one of the windows dropped unexpectedly, and for some strange reason, the door to the dressing room opened up when we turned down the driveway, even though I had locked it before we left the park. We spent a couple of minutes fixing that (just needed a little more of a bend in the catch), and I put up the windows screens with some new hooks I bought yesterday at Tractor Supply. Still need a few more to finish the job. Fixed one screen that had a broken loop as well. Spend some time organizing my office (I bought a shoe rack that hangs over a door, which I put inside the laundry door to be able to keep my office paperwork sorted out, it just seems to keep piling up! ), then settled down for the evening. Oh, and I forgot to mention, at last, one of the mares in the pasture had her baby this morning, it was frolicking around chasing mama already! Still have two more we’re watching and waiting to see born, one more in the pasture and one in the barn. Enough for today, off to bed! Saturday, January 22, 2011 – Sold the Old Trailer Today! Joined our hostess for breakfast that she prepared for us this morning, and chatted with her until our appointment, Maribel, showed up. She ended up getting a bit lost, and arrived just before 11:00. She had asked beforehand whether it would be okay to have the trailer inspected by a local trailer service place (she apparently had had a bad experience previously), to which we, of course, agreed. After looking at the trailer and liking what she saw, we hooked it up to her pickup and led her to ASAP trailer in Tomball, where a young main took a look at it. He found only minor problems, nothing that would hurt it functionality, and actually when asked what he would charge for it if he was selling it, he quoted a price almost $1000 more than what we had agreed on, so she was satisfied. We took her down to Tractor Supply to get some proper hooks for her safety chains, finalized the deal and went on our way, thrilled that we won’t have to leave the trailer behind for our hostess’ son to sell for us. Reconvened with our hostess for the rest of the afternoon before she and her hubby had to get ready for a dinner. During that discussion, and with a phone call from a friend of our hostess, our plans changed again. Now it looks like we won’t be here for two weeks, but we’ll be done here in Houston (for now) as of next Wednesday or so, so I guess we’ll be able to get to Florida sooner than we though! (Yeah!) Then we took the horses for a walk around the property, with my gelding jumping and hopping, obviously getting a bit stir crazy being in a stall for so long. We had a little practice run putting them into the trailer to see how they liked, and they had almost no hesitation getting in. They LOVED being able to stick their heads out the windows on the side when we opened, and the trailer seems so much more open and less claustrophobic, they had no problems at all. Afterward we had a quiet evening at home, watching the movie Angels and Demons, and deciding that we will go riding tomorrow, as the temps are supposed to be in the low 60’s with only a 20 percent change of rain. We found a park with horse trails only about 12 miles away (and near where my therapy clinic is), with good reviews on the internet. Looking forward to that, and so, I’m sure, are the horses! Woke up to discover Luis had already completed the repairs on the dump plumbing using only some of our parts, as he had apparently had gone out and got some of his own. So, after breakfast we ran the slides in and drove up to the dump and took care of business there. Had another physical therapy appointment at 1:00, this time Hubby came with me, where he made me laugh and counted my reps for me. Afterward we did some more running around, trying to find all the little bits and pieces of things we’ll have more trouble when we’re back on the road, and returning the plumbing parts that Luis didn’t use. Once we got back, we finally moved all of our stuff from the old horse trailer to the new one, which seems to have an incredible amount of room! I just want to make sure we don’t just fill it up with stuff, but we keep it neat and tidy. Can’t wait to get the horses in it and take this baby for a drive! Maybe over the weekend, if the weather improves. It was sunny and a bit warmer today, but still had a chill in the air. Meanwhile, I re-listed the old trailer on craigslist, hoping we can get this baby sold before we leave, though it may be mid-February if plans remain the same (and how likely is that? 🙂 Before the evening was through, we had an appointment for someone to come see the trailer at 10:00 tomorrow morning!